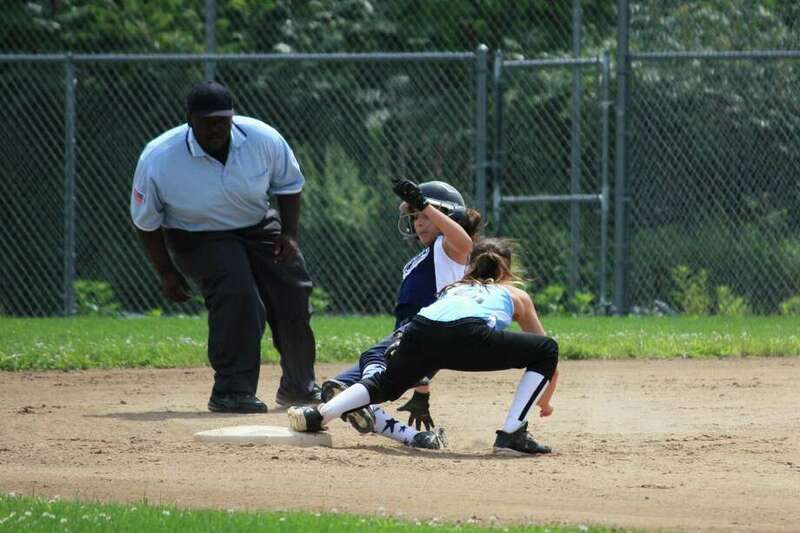 Westport's Sophia Alfero slides into second base during a 14-7 win over Enfield in Newington on Sunday in the winner's bracket final of the 10-11 Little League state tournament. Westport's 10-11 Little League softball team is on the verge of a championship. The all-stars defeated Enfield 14-7 on Sunday at Newington Memorial Field in the winner's bracket final of the state tournament. Westport needs just one win in two games against either Enfield or Seymour to win its first state crown. The District 2 champions play Tuesday at 5:30 p.m. in Newington. Enfield (District 8) and Seymour (District 3) play Monday at 5:30 p.m. to determine the other finalist. "Very confident that we can bring home the title," Westport manager Mark McWhirter said on Monday. "The girls are playing well." On Sunday, Westport scored nine runs in the second inning, then tacked on four more runs in the third. Second baseman Erin McWhirter had four hits and four RBIs, while Catherine Connell added a two-run single. McWhirter said the "biggest obstacle" for his team was the adjustment to slower pitching. While the team faced a few "flamethrowers" during District 2 play, McWhirter said, with pitchers throwing close to 50 miles per hour, the pitchers on Sunday were throwing closer to 30 mph. Westport had an 11-3 advantage in hits. "We're going to continue to adjust to that slower pitch," McWhirter said. "We're making strides to continue to wait on that slow pitch. ... It's a big adjustment." Connell earned the win for Westport in the circle, striking out nine over 4 1/3 innings. Sophia Alfero tossed 1 2/3 perfect innings in relief.